Product prices and availability are accurate as of 2019-03-06 00:14:08 EST and are subject to change. Any price and availability information displayed on http://www.amazon.com/ at the time of purchase will apply to the purchase of this product. USB-C Power Delivery for Macbook, ChromeBook Pixel and other USB-C devices based on PD charging protocol at max 20V 3A. NOTE: USB C female port is only designed for charging, NOT for data transferring. Please use power adapter(not included) under 60W. VGA output makes dual-monitor displays a breeze. 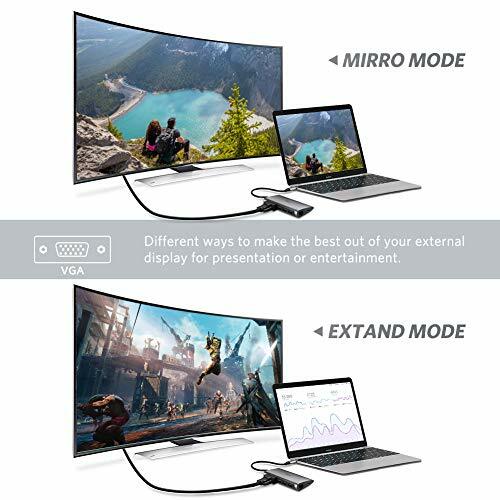 It provides a simple plug-and-play connection to almost any high-definition display or monitor and supports resolutions up to 1080P 60HZ. The USB Type C Ethernet Adapter is equipped with a RJ45 port, which supports 1000Mbps maximum via the ethernet port on the adapter, allows you to enjoy a wired stable Internet access. It supports super faster data transfer up to 5Gbps, 10X faster than USB 2.0, which allows you to transfer HD movies or files in just seconds. USB card reader easily expands SD and TF slots on your computer. 2 cards reading simultaneously keep you away from the hassle of constant unplugging and re-plugging. With built-in protection for over-current, this USB C converter can keep your digital devices and data safe. 2. The female USB C port on the converter only support charging, do NOT support data transfer. 3. Please do NOT use USB 3.0 ports for charging. 4. Please properly eject your memory card before pulling it out to avoid memory card damage or data loss. 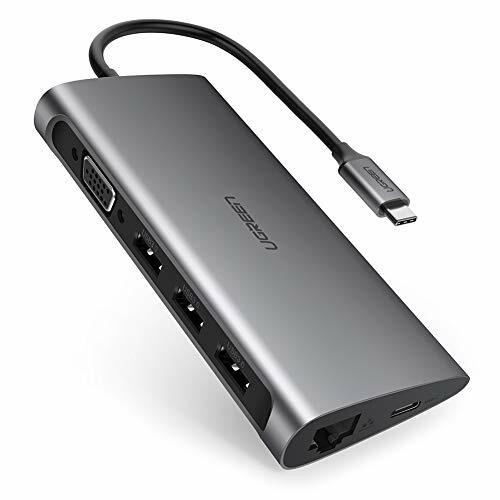 USB C MULTI PORT ADAPTER: Expand your PC's USB-C port (MUST SUPPORT DP ALT MODE) and maximize functionality with three USB 3.0 ports, VGA video output, Gigabit Ethernet port, TF SD card reader and a Type-C pass-through power delivery charging port, bringing much convenience for those laptops only equipped with a single USB type C port, such as 2016 2017 MacBook Pro, 2015 2016 MacBook, Dell XPS 13 15, Google Chromebook, Lenovo Yoga 900, HP Spectre notebook, ASUS ZenBook3, Huawei Matebook etc. SUPERSPEED USB C HUB CARD READER: This USB Type C hub adds extra 3 USB 3.0 ports allowing for connecting multiple USB peripherals like flash drive, hard drive, keyboard, mouse, MP3 player and more. Micro/SD card reader easily expands SD and TF slots on your USB C computer. Support SDXC, SDHC, SD, RS-MMC, Micro SD, TF, Micro SDXC, Micro SDHC UHS-I memory cards. Full HD 1080P 60HZ VGA OUTPUT: Mirror or extend your screen with UGREEN USB C adapter VGA port and directly stream Full HD 1080p 1920X1080 video to HDTV, monitor or projector. 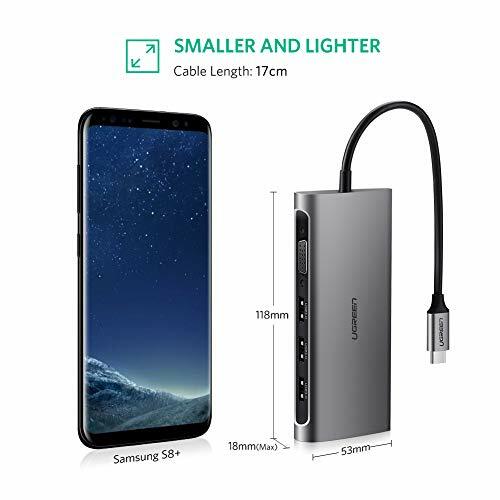 FAST GIGABIT ETHERNET DONGLE: RJ45 port definitely ensures more stable and faster wired network connection compared to WiFi and max speed up to 1000Mbps. SUPERIOR ALUMINUM CASE AND POCKET SIZE: High quality aluminum casing makes this converter durable and perfectly match with your laptop. Portable slim size makes it easy to slip into your travel bag, a perfect companion for home, office and travel. REMINDER: Compared to plastic case, aluminum case has better thermal dissipation which means heat occurred inside would be conducted to outside more quickly, making this adapter safer but hotter (which is normal) than plastic case.